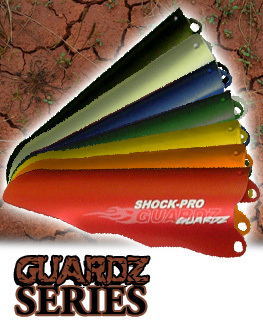 Protect your shocks with our NEW Shock-Pro Guardz! Covers the lower shock shaft section from harmful debris causing stone chips and corrosion. Replace stock spring retainer with our precision machined 6061 Billet aluminum retainer bracket. Anodized Aluminum Guardz bolt up to Billet retainer with stainless hardware. Shock-Pro logo is Laser etched for cool looks and durability.